FILE – People protest as part of the National Day of Action to Fight for $15 near a McDonald's restaurant along the Las Vegas Strip in Las Vegas, Nov. 29, 2016. 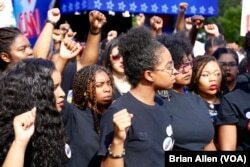 A cluster of Black Lives Matter groups and the organization leading the push for a $15-an-hour wage are joining forces to combine the struggle for racial justice with the fight for economic equality. They are launching their first national joint action April 4, the 49th anniversary of King’s assassination, with “Fight Racism, Raise Pay” protests in two dozen cities, including Atlanta; Milwaukee; Memphis, Tennessee; Chicago; Boston; Denver; and Las Vegas. 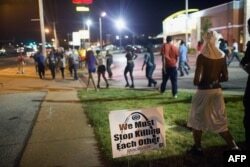 Demonstrators, marking the one-year anniversary of the shooting of Michael Brown, protest along West Florrisant Street on August 11, 2015 in Ferguson, Missouri.